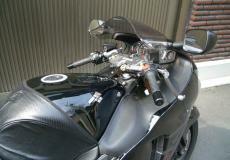 HeliBars focus is comfort zone for all day motorcycle riding. 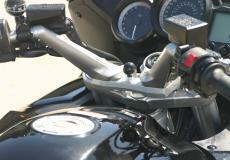 Another handlebar solution particularly popular with the sport touring riders are the fully adjustable HeliBars. Their slogan “Performance Shouldn’t Be Painful” and that is the inspiration behind the HeliBars line of motorcycle handlebars. HeliBars®, focus has been helping motorcyclists find their elusive “comfort zone” for all day riding comfort. 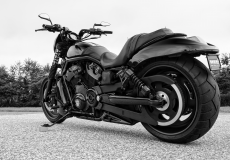 HeliBars motorcycle handlebars and risers provide the most comfortable riding position possible. Whether you’re waiting at a stop light in town or flying down a long lonesome desert highway, precision-built HeliBars transform and improve your bike’s handling, performance and comfort. HeliBars are designed for easy installation, in most cases retaining stock components and requiring little or no modification to your stock equipment. They’re made with pride in the USA by American Craftsmen and women, and backed by a one year warranty on all materials and workmanship. So when you’re done riding for the day, stop because you want to, not because you’re in pain-that’s Comfort without Compromise. This is our passion and our commitment. Sport bikes, sport touring bikes, cruisers shouldn’t be painful they should make you want to take to the open road not just for a 10 minute jaunt but a cruise towards the Horizon. HeliBars are available for BMW, CanAm, Ducati, Harley Davidson, Honda, Kawasaki, Moto Guzzi, Suzuki, Triumph, Victory and Yamaha. HeliBars motorcycle handlebars and risers provide the most comfortable riding position possible. HeliBars focus has been helping motorcyclists find their elusive comfort zone for all day riding comfort. HeliBars motorcycle handlebars and risers provide the most comfortable riding position possible.